From handling replica objects and trying on costumes in our workshops and gallery sessions, to the ever-changing exhibition and displays programme, the V&A is the place to bring students to experience inspirational learning. With fantastic, state of the art facilities in the Sackler Centre for arts education and a beautiful courtyard entrance and exhibition space to enjoy, there has never been a better time to bring your pupils to the V&A! We offer an exciting programme of hands-on workshops run by artists and designers, as well as free discovery sessions in our galleries on topics including the Great Exhibition and the Anglo-Saxons. Our free Literacy Live sessions are a great way to develop students’ speaking and listening skills using museum objects to develop exciting stories. Our Sackler Centre provides the ideal base for a visit with your class, with locker facilities and a pre-bookable lunchroom. We also offer a wide range of resources to support self-guided visits, as well as discounted tickets to exhibitions. Step inside and explore a wealth of art, design and performance that brings cross-curricular learning alive. From Anglo Saxons to Victorians, da Vinci to Rodin, Buddhism to Islam, the V&A is a fantastic learning resource for primary schools and it is free to visit. All school group visits must be pre-booked. A minimum of three weeks' notice is required for tours and workshops and a minimum of two weeks for self-guided and exhibition visits. 9.30 – 17.30, 7 days a week. Please complete this online form. Visits are only confirmed once you have been notified by our Contact Centre. You will be sent a letter of confirmation which you must bring with you on the day of your visit. The V&A is currently undergoing a major programme of renewal and restoration. If you are planning to see a specific gallery or object with your students please check the gallery closure or contact us using the details above. Enjoy our vibrant exhibitions programme and take advantage of the concessionary ticket rate for educational groups - £3 per student and teacher. Booking essential (a minimum of two weeks’ notice is required). Tickets for self-guided exhibition visits must be paid for 48 hours prior to visiting the exhibition. Tickets can only be issued once payment has been processed. If payment isn’t received beforehand unfortunately you will be unable to access the exhibition. Teachers receive a complimentary exhibition ticket when making a group booking in order to make a preparatory visit. We can issue one ticket per booking. Find out more about our exhibitions. For special Schools events linked to our exhibition programme please see Special Events. You can also use our free resources for Primary Schools to support self-guided visits and inspire activities back at school. Use our curriculum-linked resources and activities to design exciting self-guided visits to the museum, and to inspire activities in the classroom. Our range of resources include fantastic ideas to inspire learning in the classroom and on a visit to the museum. Themes include, Islamic art and design, China, Japan and India, as well as British history. Explore our galleries with V&A experts, investigate objects first-hand and try on costumes to bring to life a range of cross-curricular themes. Booking essential: Tel: +44 (0)20 7942 2000, 09.30-17.30, 7 days a week. This was an excellent session; the guide was superb at encouraging and working with the children. Museum objects are fantastic starting points for storytelling. Professional performers will encourage your pupils to explore narrative structure and vocabulary and perform to each other in small groups. Download the session summary to find out more about this popular part of our primary schools programme. Challenge and inspire your primary school students with our hands-on, cross-curricular practical sessions led by professional artists and designers. Available on selected dates. Download the Schools & Colleges brochure at the top of the page for details. A really excellent, fun and well-resourced workshop – Thank you! Multi-sensory and interactive, our sessions for students with special educational needs and disability are based around some of the most popular objects in the collections and encourage exploration through hands-on tactile objects and activities. 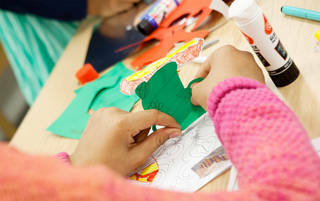 Each session involves a practical activity, creating artworks inspired by the collections. For museum visits, we can arrange a separate quiet space for lunch and changing facilities, if required, or we can come out to you and deliver the session at your school or specialist unit. We arrange a pre-visit to your school to meet students and staff before their session, to enable us to adapt the session to your group’s needs. Session themes include: Tipu’s Tiger, 18th Century Fashion, Chinese Dragon Robes, Japanese Suits of Armour, Medieval Tapestry and Islamic Tiles. Contact us at schools@vam.ac.uk to get advice about visiting, to check availability or to book one of our sessions.